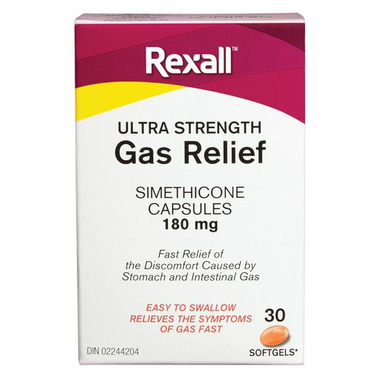 The Rexall Ultra Strength Gas Relief is made with Simethicone for fast relief of the discomfort caused by stomach and intestinal gas. Easy to swallow. Directions: Adults and children 12 years and over: Take 1 capsule as needed after meals and at bedtime. Do not exceed 3 capsules in 24 hours. Children 2 to 12 years: Use only on the advice of a doctor.